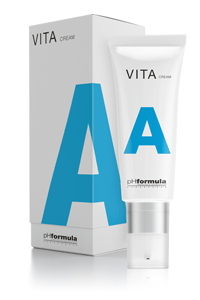 VITA A Cream - pHformula | Aspire & Co Ltd. The V.I.T.A. A 24 hour cream contains pure retinol and should be used as an advanced treatment product for ageing skin. Retinol help stimulate cell regeneration to diminish the appearance of fine lines, wrinkles, and age spots from both photo- and intrinsic ageing. Retinol is also effective in correcting blemishes and blotchiness often associated with problematic skin. The 24-hour moisturizing complex in the formula comprised of a synergistic blend of natural moisturizing factors to assist in pro-longed hydration and protection of the skin.